War justifications are required in order to declare war against opponents. The process for creating casus belli(plural is also casus belli) and executing them in your strategy is outlined below. Justification of war will cause you to gain infamy almost every time, and care needs to be taken to avoid going over your infamy limit. The longer a nation's attempt to justify the war goes undetected, the lower the infamy gained from the justification will be. The relationship between time and infamy is direct, so being discovered halfway through the process leads to gaining half of the infamy. A CB may also be gained by an event, decision or owning a core on another nation. Several different casus belli can be gained this way, but it is the only way to gain the repay debts CB. Each CB comes with a war goal. Declaring war using a CB automatically adds that goal to the war; other CBs against the same target let you add their goals without gaining infamy. Achieving a war goal brings prestige to your nation. Prestige gain is always a percentage of your target's prestige, with a minimum of what you would gain from defeating a 100-prestige nation. Failing to achieve a war goal will result in a loss of 10% of your current prestige. Each war goal will cost a certain amount of war score to demand when proposing a peace treaty; some of these quantities are fixed, while those relating to acquiring or giving up territory vary depending on the value of the territory. The cost of a war goal is only a guideline, however: usually a nation will require you to have accrued more war score than the cost of your war goals to capitulate. A nation will never accept a peace deal with a cost above 100. To add a second war goal in a war, a certain proportion of the country's population must support jingoism. Adding one makes 25% of your pops that support jingoism support pro military instead, so war goals cannot be added indefinitely. It also incurs infamy, the amount being the same as the maximum possible for justifying such a war (for example, adding Acquire State costs 11 infamy). The most important factor that causes people to support jingoism is being at war with low (less than 50%) war exhaustion (except slaves, who don't care). Unless otherwise specified, no CB can be used against the country's own puppets. Acquire State 400 days +11 Varies 4% Both nations must be either civilized or uncivilized Cede selected territory to victor. Acquire Substate Region 400 days +5 Varies 4% Target state is a substate's non-colony state (in unmodded A House Divided this means the defender is China). Cede selected state to victor. Conquest 400 days +22 85 10% Single state nations, or uncivilized nations with 4 or fewer states Annexed by victor. Place in the Sun 200 days +10 Varies 4% Target owns colonial states Cede selected colony to victor. Cut Down to Size 200 days +13 50 10% Defender has not already been cut down to size. Loses 50% of its current armies, cannot build ships or train brigades for five years, gives 25% of its tax income to victor for five years. Free People 200 days +7.5 Varies 2% Target has cores of another nation that can be released Cede selected state to nation. If the country doesn't exist and attacker is a great power, it joins their sphere of influence. Liberate Country 200 days +11 Varies 2% Target has cores of another nation that can be released Give up cores on all territory also held as cores by other nation, and cede that territory to them. Humiliate 200 days +3 15 5% Defender has not recently lost a war. Lose 25 prestige, plus 10% of current prestige. Make Puppet 200 days +10 85 5% Target is not a Great Power or subject nation, has three or fewer states Become a satellite of the victor. Add to Sphere 200 days +4 50 10% Aggressor must be a Great Power, Target is not a Great Power Become part of victor's sphere of influence. Does not result in a truce, so the victor can resume influence immediately. Take from Sphere of Influence 200 days +4 20 15% Aggressor must be a Great Power, target must be a Great Power, target has at least one nation sphered Selected nation joins victor's sphere of influence. Demand Concession 166 days +5 Varies 0.2% Must be civilized. Target must be uncivilized and have more than one state. Cede selected territory (not the capital state) as colony. Establish Protectorate 166 days +10 85 2% Target must be an uncivilized country with only one state OR no more than 4 states if attacker is a great power and has researched Nationalism and Imperialism. Annexation. Territories will become colonies. Dismantle Fortifications 200 days +4 10 10% Target has at least one state with a fort or naval base built Destroys all forts and any naval base in selected state. Liberation - 0 10 Varies Attacker has core on target state. Automatic, doesn't need to be justified. Cedes state to victor. Restoration of Order - 0 10 100 Attacker has core on all of target's provinces. Automatic, doesn't need to be justified. Annexed by victor. Free Cultural Kin - 0 30 10 Attacker's culture group has a cultural union but attacker is not that union; defender is in a different culture group but has a puppet of the attacker's culture group. Attacker must be a great power and have researched Nationalism and Imperialism. Automatic, doesn't need to be justified. Release the target puppet and add it to victor's sphere of influence. War of Unification - 0 Varies Varies Target state has a core of the cultural union of attacker's culture group, and defender is from different culture group. Attacker must be a great power and have researched Nationalism and Imperialism. Automatic, doesn't need to be justified. Cedes state to victor. Can only take the capital state if it's the defender's only state (this is a separate CB). Assert Hegemony - 0 Varies Varies Attacker and defender are both Great Powers, in the same culture group, and not unions; defender has at least one sphere member of the same culture; attacker has Nationalism and Imperialism. Automatic. Transfers all same-culture-group sphere members to attacker. Install Communism 200 days +5 70 2% Must be a Great Power and Proletarian Dictatorship. Target must not be a Great Power, not have a Communist ruling party, and have 10% Communists. Can be used against one's own puppet. Removes current government type and changes it to Proletarian Dictatorship, and adds them to victor's sphere of influence. Uninstall Communism - - 5 2% Must not have a Communist ruling party. Given to a Great Power who intervenes in an Install Communism war when that war ends with communism being installed. Expires after one year. Can be used against one's own puppet. Removes Proletarian Dictatorship and replaces it with the victor's government type, and adds them to the victor's sphere of influence if a great power. Containment - - 4 7.5% Target must exceed 25 infamy. Same as both Cut Down to Size and Humiliate. Become Independent - - 30 10% Attacker is a satellite of the target nation. Loses attacker as a satellite. Cut Down to Size (Boxers) - - 50 10% Automatically granted to all great powers after Boxer rebels successfully hold Chinese province for one month Same as Cut Down to Size. 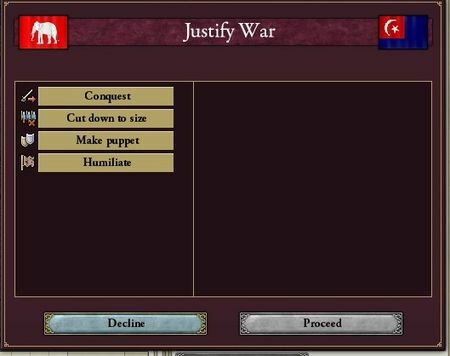 Great War Capitulation - - 0 18% Automatically added and applied to losers in wars involving multiple Great Powers on both sides once Revolution and Counterrevolution is researched Same as Cut Down to Size. Repay Debts - - 5 5% Automatically granted through event to all of a country's creditors when it goes bankrupt. Force to continue to pay interest. Status Quo - - 1 5% Automatically granted when intervening in a defensive war of a nation that is Friendly towards the country or in its sphere of influence. White peace. Civil War - - Varies Varies Used by certain events, e.g. the Taiping Rebellion. Victor annexes loser. Enforce Colonial Claim - 0 Varies 4% Attacker and defender failed to resolve a colonial crisis. Can be used against one's own puppet. Requires Heart of Darkness. Cede contested territory to victor as a colony. This wargoal is automatically added when a Great Power intervenes in a defensive war on the side of a country that is Friendly towards them. It is the same as a white peace, except that the Great Power gains or loses prestige when the war ends. There are a number of different conquest CBs, differing largely by the civilization status of the two participants and the colonial status of the target state. If the attacker has cores on a province owned by the defender, they automatically have the Liberation casus belli to conquer the whole state containing the core, unless it is their capital state (e.g. Germany can't use this to conquer western Switzerland even though they have a core there). If the attacker has cores on all of defender's land (e.g. Netherlands attacking Belgium at the start of the game), the Restoration of Order CB allows annexing all states, giving a fixed 100 prestige if won. Neither CB costs infamy. A third country's cores can be returned with the Free People CB for one state or Liberate Country for all cores; these cannot be used against states which are cores of the attacker's cultural union. In the case of Germany, Scandinavia, Italy, Yugoslavia and Czechoslovakia, this can only be used if that country already exists. A War of Unification is a war by a Great Power with Nationalism & Imperialism to conquer a core of its cultural union from another country of a different culture group. For example, any German GP can use it to conquer Alsace-Lorraine from France, which is required to form Germany. It can be used to conquer a capital state only if that's the defender's only state. It costs no infamy. Uncivilized countries attacking other uncivilized countries can conquer single non-capital states using the Acquire State CB. Civilized countries use Demand Concession for the same thing, which costs less infamy. Either can annex the entire country if it has 4 states or fewer with Conquest, which costs a lot of infamy and warscore. A civilized country can also use the lower-infamy Establish Protectorate to annex a single-state unciv; a Great Power with Nationalism & Imperialism has the privilege of using this CB on countries of up to 4 states, which usually costs less infamy and sometimes warscore if 3 or 4 states are involved. In the special case of Chinese substates, Acquire Substate Region is used on China to take a state from one of its substates (e.g. Guangxi), even its capital. In all cases, if a civilized country takes states from an uncivilized one, the state thus conquered becomes a colony. A westernizing unciv thus needs to choose whether to conquer before westernizing, allowing factories to be built in the annexed states; or to wait until after westernizing, when they will no longer impact the country's literacy and conquest will cost less infamy. Regardless of whether the attacker is civilized or not, they can conquer a single non-capital state from a civilized country using Acquire State, or a single colony or protectorate with Place in the Sun (the name applies even if it's not sunny, e.g. Yukon). The latter costs less infamy. A single-province civilized country can be annexed with Conquest, which costs a lot of infamy and warscore. Make Puppet is self-explanatory: if the attacker wins, the target country becomes a satellite of the defender. Conversely, Release Puppet causes the target to cease being a puppet of the defender; in addition, if the attacker is a Great Power, the target country also joins the attacker's sphere of influence. It cannot be used on substates. Free Cultural Kin is a variant of Release Puppet where the attacker is a Great Power, has Nationalism & Imperialism, and the target country has the same culture group as attacker and is a puppet of a country of a different culture group. It is generally a preparatory step to forming a cultural union, e.g. Prussia releasing Holstein from under Denmark before forming Germany. Add to Sphere is a war by a GP against a non-GP, non-sphered country to add it to one's sphere of influence; Take from Sphere is against another GP to steal a country from its sphere. This is the "easy", militaristic way for a Great Power to add a country to its sphere of influence. It is particularly useful when peaceful sphereing, by winning the influence war, is proving impossible (e.g. the USA and United Kingdom repeatedly discredit, expel and ban each other in Japan and so cannot get beyond Friendly). For Add to Sphere, the rival GP is likely to intervene in the resulting war. Neither can be used to sphere a puppet; for that, use Release Puppet instead (it has the side-effect of adding the country to the attacker's sphere). Assert Hegemony, which requires Nationalism & Imperialism, is a variant of Take from Sphere in the case where the two Great Powers have the same culture group, and that culture group has a cultural union, but neither GP is that union (most often this is Prussia and Austria fighting over the future German Empire). If enforced, the effect is to transfer all spherelings that share the countries' culture group from the defender to the attacker. Every day, there is 1.5% chance (0.015) of a war justification being discovered (this variable is stored as CB_DETECTION_CHANCE_BASE in the defines.lua). Therefore, the chance of being undiscovered at any particular day 'd' is equal to (1-0.015)^d. For example, if a casus belli takes 180 days to justify, the chance of never being discovered is (1-0.015)^180 = 0.0658 = 6.58%. Thus there is approximately a 2/3rds chance we'll stay under the infamy limit, and remain safe from containment wars. Such calculations are useful in calculating the riskiness of justifying a casus belli. Being involved in a Great War will allow a player to Add Wargoal on an enemy nation that is involved in the same Great War, without requiring a percentage of the population to support Jingoism. The infamy cost is also greatly reduced to 33%. With patch 3.04, warscore costs are cut to 30% in a World War.